Fierce Heavy Metal with elements of Thrash Metal, fast guitar riffs, double-bass rhythms and loads of attitude. Dark midtempo Industrial Metal with heavy guitar riffs, a distinctive synth bass and various synth melodies, drops and rises. 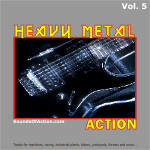 Uptempo Heavy Metal track with powerful guitar riffs and screaming tremolo-picked guitar rises that implicate speed. Great Heavy Metal entrance music for wrestlers and other fighters. Classic Heavy Metal with rattling double-bass drums and low-tuned guitars. Very fast Heavy Metal track that says only one word: speed. Midtempo Heavy Metal track with oriental lead melodies played with a sitar-like sound. Driving powerful Heavy Metal track with forceful guitars, wild leads and a blast beat middle section. Fast and furious Heavy Metal with wild riffs and even wilder lead guitars. 80s Heavy Metal with phrygian guitar riffs and exotic lead melodies played over a non-stop double bass rhythm. Midtempo Industrial Rock / Metal with dark guitar riffs and a busy beat. Dark, clumsy Death Metal with low-tuned guitars and haunting strings. Licenses available for Film, TV, Games and Commercials. Special requests for custom-made music welcome. As of January 2019 Julian Angel has switched PROs to BMI for the world excluding Germany, which is still being handled by GEMA. Julian has set up VNOIZE Publishing (BMI) in the U.S. to be yet closer to the U.S. market. A couple of Julian's songs are being used for the current NASCAR season. We are using cookies to improve the usability and performance of our website. You agree by using our website.